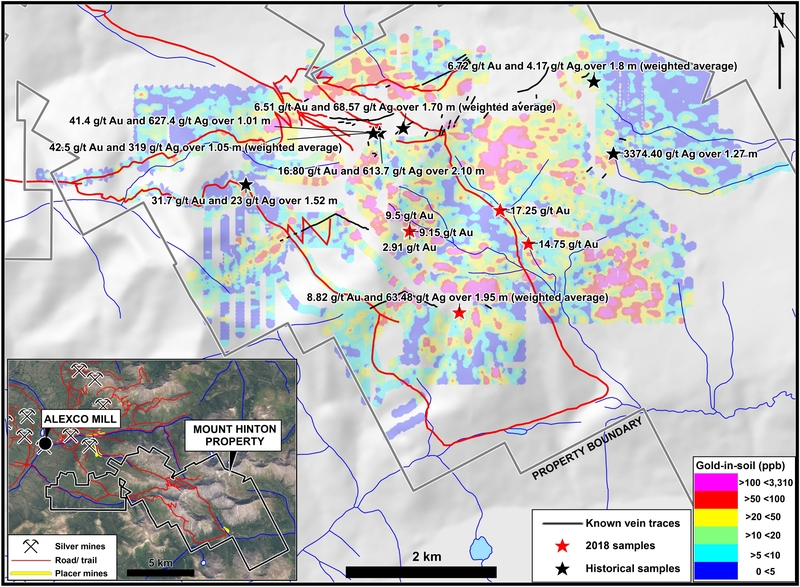 Strategic Metals Ltd. discovers imp | Strategic Metals Ltd.
September 13, 2018 – Strategic Metals Ltd. (TSX-V: SMD) (“Strategic”) is pleased to announce results from 2018 exploration work at its wholly owned Mount Hinton property, located within the prolific Keno Hill mining camp in central Yukon Territory.The Mount Hinton property is road accessible and lies three to fifteen kilometres south of Alexco Resource Corp’s mill in Keno City. The Mount Hinton property hosts numerous precious metal rich veins developed in steeply dipping dilatant zones, which cut the same stratigraphic package as the Keno Hill veins.Previous work has identified several well mineralized veins that have not yet been tested by diamond drilling (see figure attached). The 2018 exploration program at the Mount Hinton property focused on the Granite Creek drainage where recent placer mining has yielded large gold nuggets and wire gold, indicating a nearby bedrock source (see photos on website).The program consisted of prospecting and soil sampling done with a Yukon Minerals Exploration Program (YMEP) grant.Strategic would like to thank the Yukon Government, and specifically the Yukon Geological Survey, for awarding a YMEP grant for the 2018 exploration program on the Mount Hinton property. Float samples from new areas of mineralization on the east side of Granite Creek yielded 17.25 g/t gold, 225 g/t silver and 2.01% lead, and 14.75 g/t gold, 633 g/t silver, 2.22% lead. Analytical work was done by ALS Minerals, with sample preparation in Whitehorse, Yukon and assays and geochemical analyses in North Vancouver, British Columbia. All rock samples were analyzed for gold by fire assay fusion and inductively coupled plasma-atomic emission spectrometry (Au-ICP21) and 51 other elements by aqua regia digestion and inductively coupled plasma-atomic emission spectroscopy (ME-MS41). Overlimit values were determined for silver, lead and zinc by aqua regia digestion and inductively coupled plasma-atomic emission spectroscopy (Ag- and Pb-OG46).Overlimit analysis for samples with lead greater than 20% were completed by acid dissolution and titration (Pb-VOL70). The 2018 field program on the Mount Hinton property was managed by Archer, Cathro & Associates (1981) Limited (Archer Cathro). Technical information in this news release has been approved by Heather Burrell, P. Geo., a senior geologist with Archer Cathro and a qualified person for the purpose of National Instrument 43-101. Strategic is a project generator with a portfolio of more than 130 projects that are the product of over 50 years of focused exploration and research by a team with a track record of major discoveries. Projects include 119 wholly-owned, 5 joint-ventures, 2 under option and 8 royalty interests. Projects available for option, joint venture or sale include drill-confirmed prospects and drill-ready targets with high-grade surface showings, geochemical anomalies and geophysical features that resemble those at nearby deposits. Strategic has a current cash position of over $10 million and large shareholdings in a number of active mineral exploration companies including 45.3% of GGL Resources Corp., 41.75% of Rockhaven Resources Ltd., 30.2% of Precipitate Gold Corp., 17.8% of Silver Range Resources Ltd., 9.1% Trifecta Gold Ltd., and 6.7% of ATAC Resources Ltd. These shareholdings are forecast to provide Strategic with indirect exposure to more than $16 million of diamond drilling in 2018.